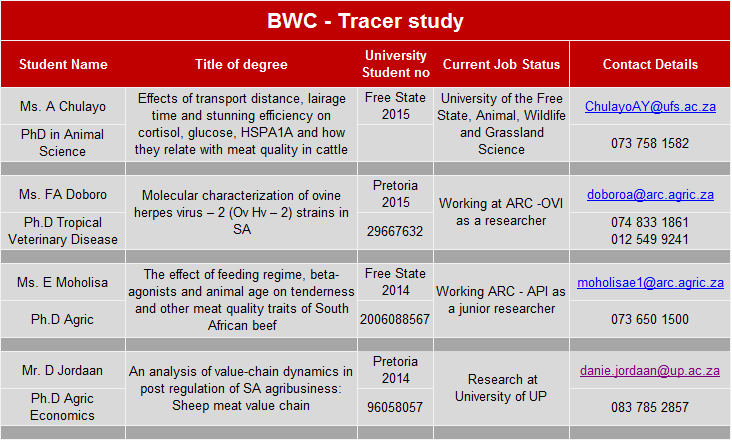 The Meat Industry Trust (MIT) makes funds available on an annual basis for bursaries to meritorious students for post-graduate studies at South African tertiary institution in fields of importance to the Red Meat Industry. The purpose of the bursary scheme is to create further scientific capacity in South African and to address industry research needs. The MIT administers the scheme via its Bursary Working Committee (BWC), who liaises closely with the tertiary institution and the relevant Head of Department and / or Supervisor under whose guidance the student will conduct the post graduate study (Masters or Doctorate). Some of the successes and progress of our Bursary recipients since 2009 is available. Theses with their titles and the current employments status of our bursars. A history to be proud of! The table summarises the support and grants to students since 2008 up to 2018.